I'm SOO glad for this warmer weather! It's been so nice here lately except for a few chilly, rainy days this week. That being said, it's been hard to find some crafty time and my mojo has definitely suffered! Little girl decided to cooperate with her morning nap the other day, so my son and I headed down to the play room/craft room for a few minutes of craftiness. I actually got 3 cards made too! (In between being "served" "food" from the "restaurant".) Too cute though. This little guy is Balloon Trevor. He's part of the CC Designs Sugarplums collection - you can find them in the Paper Jewels store. I think he's just right for my young cousin's birthday coming up later this month! I used Splitcoast sketch challenge SC179 for this layout. 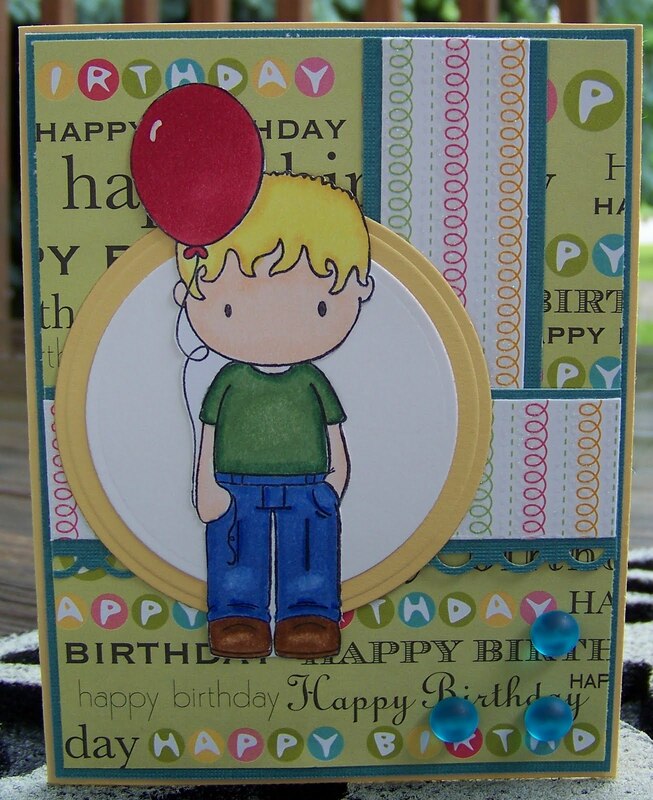 Supplies are SU cardstock in Barely Banana, some DCWV cardstock, and I think both DP's are also DCWV. The image is colored in with Copic markers, I used a white opaque Gelly Roll Pen to highlight the balloon, dots are Martha Stewart, I also used a SU scallop punch and Nestabilities for the circles. Oh I love that punched edge this is really cute . Colleen, this is so adorable! I just love this image and your design and coloring are super! 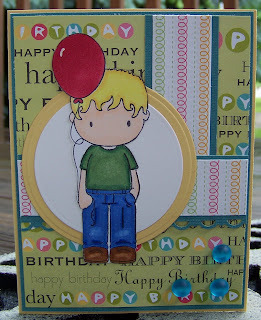 Awesome boy card.. love the red balloon!! This card is awesome...I just love it! Can I just say your coloring is getting really really good!!!! I love that DP and the all over look of this! !